"My vegetarian husband goes crazy over these every time! They are really cheesy, a little bit spicy, and a little bit sweet. Feel free to play around and add chicken or veggies, if you desire. 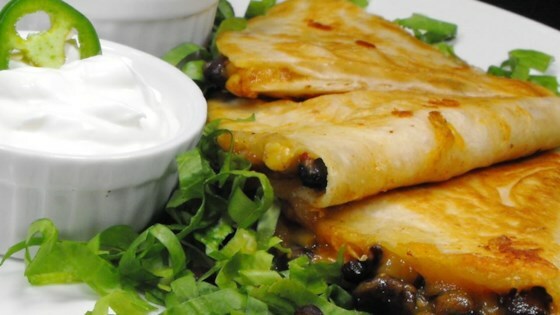 Don't forget the salsa and sour cream!" This is a quick easy dish that my family loves. I have made it twice. The only change is folding over the quesadilla to make it easier to handle. Thank you for this healthy meatless meal.